This portion of the website contains a group of vegetation maps at three scales in the vicinity of the Toolik Field Station, Alaska, an arctic research facility run by the Institute of Arctic Biology at the University of Alaska Fairbanks. The maps are intended to support research at the field station. 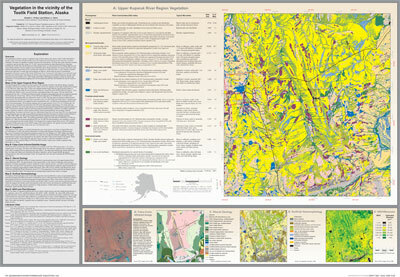 The front side of the published map sheet contains a vegetation map and ancillary maps of a 751-km2 region surrounding the upper Kuparuk River watershed (the Upper Kuparuk River Region), including the Toolik Lake and the Imnavait Creek research areas, as well as portions of the Dalton Highway and Trans-Alaska Pipeline from the northern end of Galbraith Lake to Slope Mountain. The reverse side shows more detailed vegetation maps of the 20-km2 research area centered on Toolik Lake (Toolik Lake Area) and a 1.2-km2 intensive research grid (Toolik Lake Grid) on the south side of Toolik Lake. All of the maps are part of a hierarchical geographic information system (GIS) and the web-based Toolik-Arctic Geobotanical Atlas (T-AGA). The T-AGA also includes other map themes for all three areas and a previously published hierarchy of maps of the Imnavait Creek area (Walker et al. 1989; Walker and Walker 1996). Photos and explanations of the geobotanical mapping units, the supporting field data and metadata are also on the website. D.A. Walker and H.A. Maier. 2007. 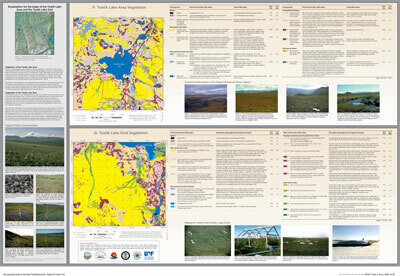 Geobotanical maps in the vicinity of the Toolik Lake Field Station, Alaska. Institute of Arctic Biology, Biological Papers of the University of Alaska, No. 28. ISSN: 0568-8604. ISBN: 978-0-9767525-2-3. Contact Marie Gilbert at the Institute of Arctic Biology (907.474.7412), on the University of Alaska Fairbanks campus. Map is printed on glossy paper; available in an envelope or rolled with a rubber band for $10.00, or in a mailing tube for $13.50. Price list for Biological Papers of the University of Alaska (BPUA) (PDF, 43K).